We’d like to introduce you to Mary Wambui Waweru, the liaison officer with Europe at the Africa Regional Office, in Nairobi. Mary is from Kenya and her main duties within her role will be to help provide support for partnerships and projects that stretch between the two regions. Mary’s background lies in her work as the Pan African Coordinator for the International Young Christian Students (IYCS) where she worked for four years. IYCS is an International Students Movement which aims to develop and empower young people to face the present day challenges through training and capacity building. She has a lot of experience in promoting networking and partnerships with other NGO’s locally and Internationally, fundraising, general office administration, project development and implementation of projects around peacebuilding and conflict resolution, leadership and good governance, HIV/AIDS, education, poverty and sustainable ecology. It is through her work at the IYCS Regional Office that she got the opportunity to work with the WOSM-ARO through the partnership office on some activities together in Kenya and Cape Verde. 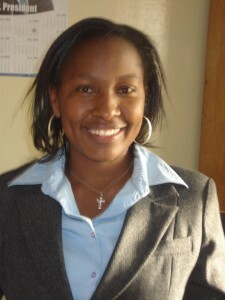 She has also worked with WOSM through the Network of International Youth Organizations in Africa (NIYOA). • Providing content and supporting the drafting/revision as well as implementing joint project in particular any multilateral Euro Africa projects. • Researching and providing support in the development of Region-to–Region projects especially in collecting relevant project materials.